My grandma on my dad's side has been in and out of the hospital lately, most recently from a rough bout of pneumonia I believe. I'm not sure all of the details, but she was released on Monday. Apparently, she was staying at a friend's house for whatever reason, and as of this evening, she was rushed back to the hospital because she became unresponsive. She was getting a brain scan tonight I think so as of now it's just a waiting game to hear what's going on. She lives in Ohio while I grew up in the South. And although we don't see each other often, we are extremely close. I know she's been sick, but to hear it be this serious pretty much freaks me out. 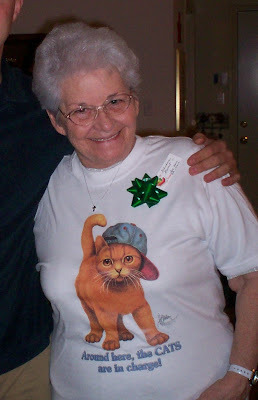 If you don't mind, would you say some prayers for my Grandma tonight? I'm not ready to bear with the thought that she might not be with us much longer, so I'm praying hard for her to come out of this one ok. I shall include your grandma in my prayers.